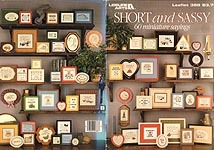 Short and Sassy , Leisure Arts, 1985. 60 small designs with motifs and sayings. Very good condition. 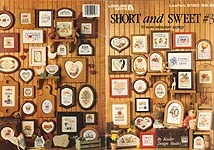 Short and Sassy #2, Leisure Arts, 1987. 46 small designs with motifs and sayings. Very good condition. Short and Sweet #2, Leisure Arts, 1986. 50 small designs with motifs and sayings. Creased diagonally, but otherwise very good used condition. Short and Sweet #3, designed by Kooler Design Studios, Leisure Arts, 1992. 50 more small designs with motifs and sayings. May have price tag residue on cover; otherwise, very good condition. 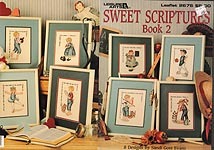 Sweet Scriptures, Book 2, designed by Sandi Gore Evans, Leisure Arts, 1995. 8 designs: For He Shall Give, Comfort One Another, For Man Looketh, Be Joyful, The Trying of Your Faith, All Things Are Possible, Teach Me Thy Way, And Ye Shall Know the Truth. Price tag on cover, but otherwise excellent condition. Four Seasons Charted Designs for Cross Stitch & Needlepoint, designed by Anne Van Wagner Young, Leisure Arts, 1980. Graphs include: Spring Rainbow, Summer Bluebirds, Autumn Squirrel, Winter Cardinals, Spring Oval, Summer Oval, Autumn Oval, Winter Oval, Spring Sampler, Summer Sampler, Autumn Sampler, Winter Sampler. Full upper & lower case alphabet also included. May have price tag on front cover; otherwise, very good condition. 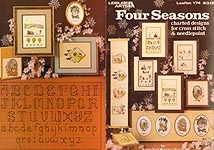 Four Seasons Charted Designs for Cross Stitch & Needlepoint, designed by Anne Van Wagner Young, Leisure Arts, 1980. Graphs include: Spring Rainbow, Summer Bluebirds, Autumn Squirrel, Winter Cardinals, Spring Oval, Summer Oval, Autumn Oval, Winter Oval, Spring Sampler, Summer Sampler, Autumn Sampler, Winter Sampler. Full upper & lower case alphabet also included. Former owner's name stamped on front cover, may smell perfumey; otherwise, excellent condition. 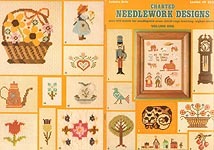 Charted Needlework Designs, Volume One, Leisure Arts, 1975. 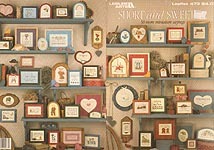 Over 100 motifs for needlepoint, cross- stitch, rugs, knitting, afghan crochet: butterflies, basket of flowers, flower borders, spinning wheel, coffee pot, candle, bellows, kerosene lamps, chair, pipe, musket w/ powder horn, Grandfather clock, inkwell, bottles, churn, pitcher/ bowl, high button shoe, spectacles, bell, coffee mill, jug, wall clock, salt box, boy with fish, toy soldier, drum, bugle, teddy bear, ladybug, girl with flower, girl sweeping, girl embrodiering, house, cat, buildings, house with fence, sayings, farmer & wife, barn, tractor, wagon, hen, strawberries, pea pod, turkey, milk can, cow, pig, sheep, corn, goose, chick, carrot, radish, mailbox, tomato, sun, evergreen tree, well, country hearts & flowers, ship, keys, birds, acorns & leaf, plants, pie, rolling pin, watering can, plant, beater, washboard & clothespins, umbrella, tea, teapot, flat iron, salt & pepper shalkers, fruit, four seasons tree, full alphabet & numbers, and many others. Very good condition. Terrific Towels, designed by Barbara Baatz, Leisure Arts, 2001. Designs include: Tomatoes, Pears, Cherries, Fig, Oranges, Hen, Rooster, Primrose, Dahlia, Zebra, Cheetah, Mushrooms. Slight page warping around bottom corner -- may have been damp? 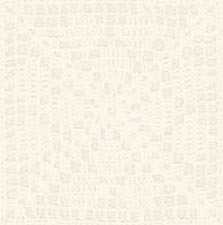 Not seeing any stains or smelling any musty odor. Otherwise, very good condition. 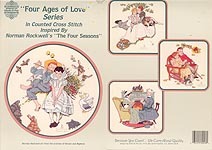 "Four Ages of Love" Series, Inspired by Norman Rockwell's "The Four Seasons", Designs by Gloria & Pat, 1988. Graphs include: Sweet Song So Young, Flowers in Tender Bloom, Fondly We Do Remember, and Gaily Sharing Vintage Times. Price tag residue on cover, but otherwise like new. 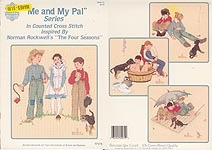 "Me and My Pal" Series, Inspired by Norman Rockwell's "The Four Seasons", Designs by Gloria & Pat, 1990. Graphs include: A Young Man's Fancy, Fisherman's Paradise, A Lickin' Good Bath, Disastrous Daring. Price tag residue on cover, but otherwise like new. 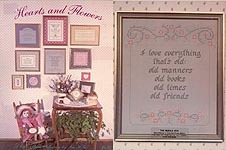 Sweet Memories Cross Stitch, designed by Trice Boerens, Linda Durbano, Karen Gardiner, and Tina Richards, The Vanessa- Ann Collection, 1981. 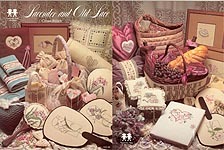 Designs include: Heart Shaped Pillow, Book Cover, Satin Basket, Poem Border, Heart Card, Flower Book Cover, Snowflake Basket, Hart on Christmas Tree, "Les Fleurs" Egg, Satin Basket, "Chick" Egg, Heart & Rabbits Egg, Wedding Sampler, Large Flower Picture, Butterfly Clutch Bag, 5 different Bears, Teddy Bear Afghan, Rabbit Music Box, Square Connemara Pillow, "Egg" Card, Rose Pillow, and Valentine Bookmark. Excellent condition. Lavender and Old Lace Cross Stitch, designed by Trice Boerens, Linda Durbano, and Tina Richards, The Vanessa- Ann Collection, 1981. Designs include: Pillow with Initiial Band, Heart Book Cover, Love, Heart Trapunto Pillow, Orchid Mirror, Orchid Pillow, Lily Fan,Rose Fan, Iris Fan, Flower Border Bath Towel, Patchwork Bag, Christmas Angels, Christmas Angel Soft Box, NeckRoll Pillow, Wine Basket, Monogram Heart Book Cover, 4 different Shells, Wooden Box, 2 Hearts & Flowers Sachet Bags, Tulips Sachet Bag, Plaid Heart Box, Wine Bags, Rimini Pillow. Excellent condition. 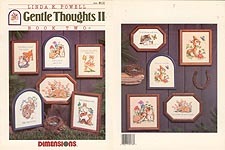 Gentle Thoughts II, designed by Linda K. Powell, Dimensions, 1987. Designs include bunny with butterfly, two puppies, two rabbits, kitten with butterfly, fawn, puppy & kitten, chipmunks, and mouse with butterfly. Very good condition. 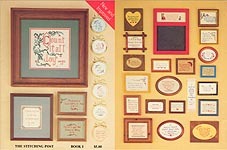 "Count It All Joy" -- The Stitching Post Book 1, designed by Carloyn Lee Heiden, The StitchingPost, 1979. Over 30 inspirational graphs in several sizes. Excellent condition. 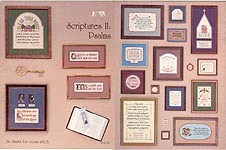 Scriptures II: Psalms, designed by Connie Killgore, Olde Town Designs, 1984. 24 charts in a variety of sizes. Price tag scar on cover, but otherwise excellent condition. 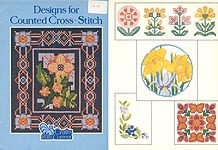 Designs for Counted Cross Stitch, Crafts from Current, 1982. Over a dozen graphs including florals, a bunny floating on an inner tube, butterflies, a heart, a house, and a ladybug. Very good condition. 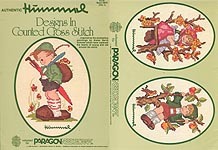 Authentic Hummel Designs in Counted Cross Stitch, Designs by Gloria and Pat/ Paragon Needlecraft, 1990. 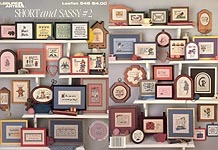 Charted designs include: Lots of Luck, Umbrella Kids, Apple Tree Boy, Apple Tree Girl, Mother Swan, Postman, Little Friends, Spring Frog, Boy Blowing Horn, Book Lore, Girl Kissing Doll, Singing Quartet, Sitting Happily Together, Umbrella Girl, Helping Mother, None For You. Tag on front, numbers by some graphs -- otherwise, very good used condition. 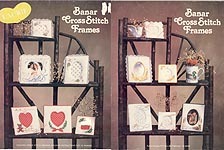 Banar Cross Stitch Frames, designed by Barbara Finwall,, Banar Designs, 1981. 12 graphs for all occasions, plus a complete alphabet and instructions for making a padded frame. Very good condition. 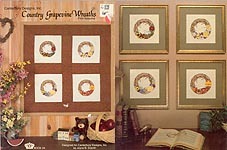 Country Grapevine Wreaths (Four Seasons), designed by Joyce B. Drenth, Canterbury Designs, Inc., Designs, 1984. 4 graphs: Winter, Spring, Summer, and Fall. Tag scars on cover, but otherwise excellent condition. Mini Country Samplers, Vol. 2, designed by Angie Austin Newton and Marueen Golden Appleton, Canterbury Designs, Inc., Designs, 1984. Designs include: Friendship is the Nicest Gift Sampler, Hospitality Sampler, Home Swet Country Home, Laughter Can Lighten Any Load, To Be Virtuous Is to Be Happy Sampler, A Friend is a Gift Sampler, Happy Is the Home That is Filled With Friends, and conversion chart and alphabet. Excellent condition. 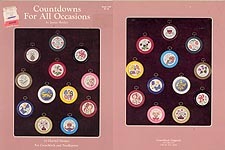 Countdowns for All Occasions, designed by Janice Shirley, Cross- Stitch Originals, 1981. 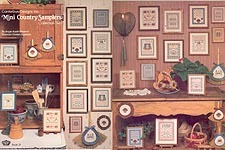 24 charted designs for cross- stitch or needlepoint, including Strawberries, Blackberries, Orientals, Thank You, Get Well, 2 Butterflies, 2 Mushrooms, I Love You, Smile, Daisy, Violet, 2 weed pots, 2 girls, 2 boys, Welcome, Bless this House, "Sit On It," and "Bug Off." Very good condition. 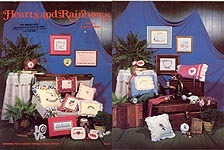 Hearts and Rainbows, Book 2, designed by Bette Ashley ,Bette Ashley Designs, 1981. Charts include: Blue Girl with Heart, Heart of My Heart, I Love You More, Lavender Girl With Heart, "Love, Love, Love, Love," Happiness Is, Wherever You May Wander, A Friend Is, Because of You, Rainbow Butterflies, Rainbow Balloons, Rainbow Heart With Cat, Lace Heart With Rose, Rocking Unicorn, It Takes Both Rain and Sunshine, Lace Heart- Love, Rainbow and Clouds, 6 different Heart Borders, Monza Pillow, Wedding/ Anniversary Heart, Alphabet, Musical Rainbow, and House with Rainbow. Store sticker on cover, but overall very good condition. 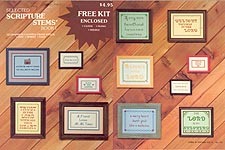 Selected Scripture Stems, Book 1, designed by Fran Hieber and Mary Osborne, Stirrup Associates, Inc., 1982. Full- size graphs include: Trust in the Lord With All Your Heart, As For Me and My House We Will Serve The Lord, A Friend Loves At All Times, The Lord Is My Shepherd, Delight Thyself In The Lord, Rejoice In The Lord, If Any Man Be In Christ He Is A New Creature, and A Merry Heart Doeth Good Like A Medicine; mini graphs include Praise The Lord, God is Love, Loev One Another, and Jesus Loves Me. Some pencilled notes and circled materials lists but overall good used condition. 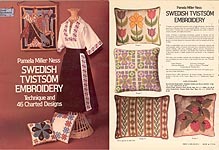 Pamela Miller Ness Swedish Tvistsom Embroidery, designed by Pamela Miller Ness, Dover Needlework Series, 1981. 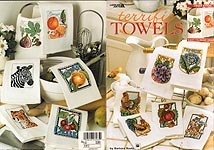 Technique and 46 charted designs for a variety of uses such as clothing, table linens, handbags, pillows, pictures, Christmas ornaments, upholstery, and more. Designs rage from adaptations of historical motifs to highly shaded flora and fauna to completely abstract. Very good condition. Hearts and Flowers, designed by Sue Hillis, 1982. Graphs include: Wedding Sampler and alphabet, Grow Old With Me, Love Puts a Twinkle, Heart, I Love Everything That's Old, Love Is a Gift, I Love You, Our Lives Are Filled With Simple Joys, Pennsylvania Dutch- type hearts, Love Is to Share, and You're Special. Store sticker on back cover, but overall very good condition. 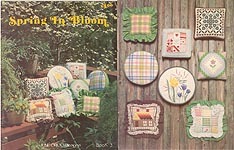 Spring in Bloom, June Griggs Designs, 1979. Graphs include: Hearts A Plenty, Count Your Squares, Ribbons 'N Patches, Box Plaid, Round Plaid, Mothers Are Special, Bless This House, and Spring in Bloom. Check marks by some materials, but otherwise very good used condition. 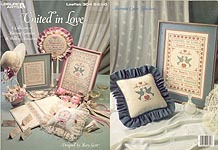 United In Love, designed by Mary Scott, Leisure Arts, 1984. Happiness Sampler, Marriage Blessing, United In Love Sampler, Ring Bearer's Pillow, and Border, plus complete alphabet. Good used condition. 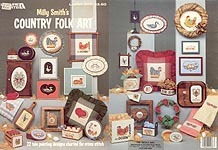 Milly Smith's Country Folk Art, designed by Milly Smith, Leisure Arts, 1983. 22 tole painting designs charted for cross stitch: Pretty Pig, Blue Hen with Chicks, Calico Cat, Happy Baker, Gaggle of Geese, Girl Feeding Chickens, Swan in Heart, Swan, Quail in Heart, Coral Birds, Watermelon Heart, Quail in Wreath, Eggs in Heart, Silly Goose, Give Us This Day..., Hen With Eggs, Watermelon Slice, Quail in Mini Heart, Cardinals, Roosters, Dozen Eggs. Very good condition. 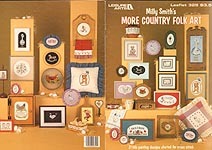 Milly Smith's More Country Folk Art, designed by Milly Smith, Leisure Arts, 1984. 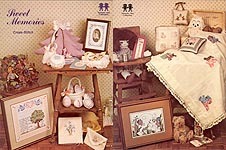 21 tole painting designs charted for cross stitch: Hen with Poem, Milk Bottle, No SMoking, Piggy- Backed Pig, Family Tree (with alphabet), Little Duck, Apples, Welcome House, Kissin' Geese, Girl With Geese, Goose in Heart, Watermelon, Sheep, Rocking Horse, Partridge, Pig, Teddy Bear with balloon, Hen with Strawberries, Birds with Heart, The Cat that Ate the Canary, Welcome Goose. Good used condition -- overall wear, bottom corners bent, some pencil notes on color charts. 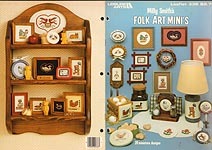 Milly Smith's Folk Art Mini's, designed by Milly Smith, Leisure Arts, 1984. 20 designs include: Little Duck, Goose, Cat That Ate the Canary, Teddy Bear, Two Birds, Cardinals in Heart, Swan in Heart, Blue Hen With Chicks, Rocking Horse, Swan, Love Birds, Welcome, Country Goose, Home, Quail in Heart, Calico Cat, A Dozen Eggs, Sheep, Pig, Tulip. Center staples rusted, 3-hole punched, punch is over three center graphs but you can figure out stitches from context.